Price is 17% below the initial Lego retail price, a € 15.15 discount! This comes down to 5.42 cent per brick. 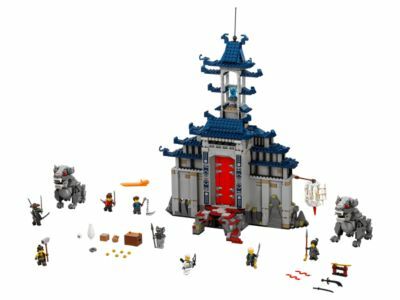 The Temple of The Ultimate Ultimate Weapon (70617) Lego set is available from the sites below. However, they do not offer delivery to your selected region. The Temple of The Ultimate Ultimate Weapon (70617) Lego set is no longer directly available from the sites below. However, 3rd party partners of these sites might still have the set available. Alternate description Evade the traps inside the Temple! Activate the hidden blade shooter under the scroll to topple a minifigure. Weapons include Kai’s 2 katanas, Nya’s tasseled spear, Cole’s hammer, Zane’s bow and arrow, Lloyd’s Chinese tasseled sword, Jay's chain with spike and Jungle Garmadon's 4 swords. Temple of The Ultimate Ultimate Weapon measures over19” (49cm) high, 14” (38cm) wide and 11” (28cm) deep. Temple guardians each stand over 3” (10cm) tall.